Described as “Game of Thrones meets Dune,” Pearseus is a dark epic fantasy series with a sci-fi twist that takes ancient Greek history and myths and transports them to space. 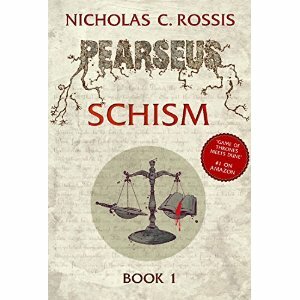 Pearseus: Schism is a short novelette that lays the back story to the best-selling series. I know I usually put some kind of disclaimer about whether I received the book from the author, publisher, etc. and I haven’t done that in the past month. I signed up for the free trial of KU and have been reading whatever I pleased of the books available. I do have more submitted books to read, but thought I’d enjoy checking out my trial subscription for a month. Anyway, any books recently that do not indicate where I got them came from the subscription. I’ve been pounding away pretty steadily at the list of books I picked to read from it before the 25th of the month. Anyone who reads this blog sees comments by Nicholas Rossis fairly often. I first discovered Mr. Rossis’ writing from Rise of the Prince, Book 2 of the Pearseus series. As Book 2 did a good job of describing what had gone on before, I went ahead and read Book 3 after that. Given the aforementioned KU trial, I finally got around to reading Book 1. It was interesting to read the prequel to the other stories. I truly enjoyed reading the story itself instead of just the explanations given in the later books, though those explanations were plenty to allow me to know what important events had taken place in the past. However, reading the explanations in later books is kind of like reading a history book. You know what happened and you know it was important, but you didn’t get to see it yourself. So, Schism begins on the ship Pearseus during a New Year’s Eve party, but none of the guests expect the turn that their evening will take. One man, listening to the voices in his head, changes all their lives and leaves the survivors struggling to pick up the pieces on the planet where they crash. Power is a seductive drug and those who seek it will stop at nothing to get what they want, but could there be something else leading the crashed colonists to seek control over their fellow passengers? That’s what you will have to discover on your own if you haven’t yet read this series. There are fantasy elements to this science fiction story, but it was all wrapped up nicely together and I didn’t have any problem moving in that direction with the author. Schism filled in the pieces for me as far as getting to see it myself. I really enjoy Mr. Rossis’ stories and have now reviewed several of them. The Pearseus series is an excellent story about mankind starting over on a new planet, ill prepared as the characters are. Mankind has many issues in the manner we deal with one another and this book shows many of the ways that we treat one another, why we don’t fight for ourselves when we should, etc. Anyway, having read the ending of the story previously, there really weren’t any surprises for me here. I was just filling in the back story. I really enjoyed the novella. It’s not all that long (under 100 pages), but it gives a more detailed explanation of the basic information for the beginning of the story if you started reading later in the series like I did. If you haven’t read the series then this is obviously the right place to start. I think this is an interesting series and that Mr. Rossis did a good job with it. The books that follow it are even better. I hope you get a chance to read the series. Thank you so much for the kind review! I’m glad you enjoyed Schism. As you may know, I’ve been toying with the idea of rebranding it as a prequel novelette from the universe of Pearseus, so that people start with Rise instead. I wonder what your thoughts on that might be, as you’ve now read all three books. Thank you again for taking the time to review my work. It’s much appreciated!! You’re welcome. I think it would be fine as a prequel novelette. I started with Book 2 and didn’t have any problem following what had gone on before. I read Schism because I was interested in more detail about the back story, but the story didn’t really require it. It’s the same reason I read the Brian Herbert and Kevin J. Anderson continuing Dune books. I just wasn’t ready to be done with the story. Hey again. I’m finished with at least the first volume of my new series. I could have sworn you had information for a cover artist that was pretty reasonable posted on your blog at some point recently. I went back over several weeks of posts (maybe it’s been longer than I thought), but couldn’t find it. Any chance you could send me a web link or something? I can’t draw LOL. He has some lovely premade covers. That would be great. I am kind of hoping you’re up for a beta read too. I’ll send you an email to discuss the above.